The use of laser has a great range of indications in dentistry. Dentist at the Center of Family Dentistry iStomatolog have more than 8 years of experience of conducting laser therapy. Our center currently offers treatment with the Picasso laser. Thanks to a great capacity range, it can be used in a wide variety of medical procedures: from sterilization of fissures before the sealing to surgeries. The healing period passes without any pain. The impact of the laser is strictly topical, which excludes the possible effect on surrounding healthy tissues and the body in general. No side effects. The laser therapy can be performed on patients with autoimmune diseases, diabetes, cardiopathy, hypertension, thyroid gland disorders, allergies, children and pregnant women. How is the laser therapy conducted? When treating fissures before the sealing, the dental cavity before the restoration or working on reducing oversensitivity, the surface of a tooth is cleaned from hard and soft dental residue (plaque and tartar) with the help of ultrasound, Air Flow, or various pastes, and only then treated by laser. The time of laser impact on one tooth is less than a minute. When treating a cyst or the root canals before the sealing, the root canal undergoes the preliminary cleaning and rinsing, followed by the actual laser treatment. The time of laser impact on one root canal in less than a minute. When removing a purulent process in soft tissues, the laser becomes an alternative to scalpel because it allows the doctor to make the cut quickly without analgesic injection. 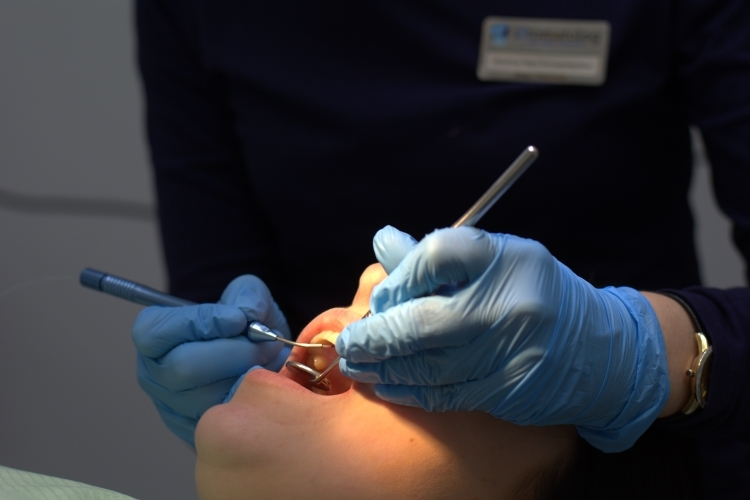 A professional removal of dental plaque is carried out when fighting the acute inflammation or sterilizing the dentogingival pockets in cases of gingivitis and periodontitis. The laser treatment of one buildup/tooth takes less than one minute and does not require additional analgesic injections; the result is achieved after a single session; no pain or swelling after the therapy. Sterilization of root canals before sealing. Prophylaxis and treatment of inflammation of gums (gingivitis) and surrounding tissues (periodontitis). Preparation of the dental surface before the fissure sealing. What is the cost of laser treatment? You can get the information regarding laser treatment of caries, root canals, gingivitis, periodontitis, and herpes in the course of a free consultation at the iStomatolog center. Payment for all services is made in the national currency of Ukraine - Hryvna.